Autumn colours and snow can arrive early as mid August on the tundra. The vast panoramas dotted with herds of caribou are equally as wondrous as the tapestry and complexity of the tundra's microcosm. 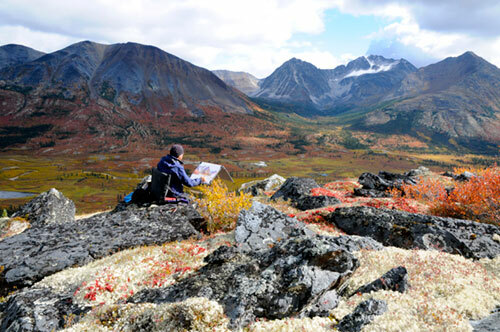 Paintings and photos were completed along the Canol Heritage Trail which passes through the Northwest Territories and Yukon border in northern Canada. The Objective of this trip was to have a further understanding of the tundra and sub tundra landscapes to complement a large body of paintings from the Arctic regions that I have worked on for the past several years. Special thanks to Dechenla Lodgefor their hospitality and for my painter friends Dominik Modlinski and Tim Schum for doing much of the driving!